I’ve colored on some other cardstocks with things like pencil….most of my Copic I’ve reserved for Neenah. I happened to have *surprise* a pack of Lawn Fawn paper in the studio, so I decided to try it out! Watch the video below or click HERE to see it in HD on YouTube. So simple but so pretty…and now I have a card ready for the next occasion for which I don’t really “feel” like making a card due to the emotion. It’s always good to have one in the card basket! Very pretty! I have not tried Copic coloring on colored cardstock but after seeing this beautiful card, I want to give it a try. Thank you Sandy for the beautiful card and tips you gave in the video. I think this is a lovely sentiment for a sympathy and the coloured cardstock is great, I would never think of such a colour for this kind of card. Such a beautiful card, I hadn’t thought of trying Copics on coloured cs. TFS! Quite elegant Sandy….would soothe any heart!!! 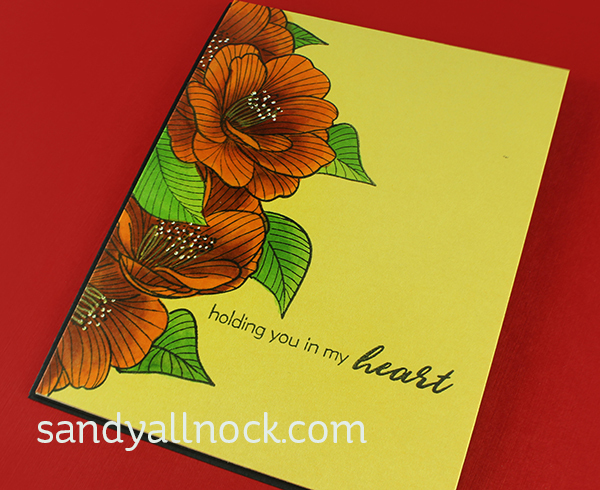 Thanks again Sandy loved this card and love that sentiment- the flowers look so vibrant on the yellow card. Thanks for sharing. This is a beautiful stamp, and I love the layout of your card. Never thought to use colored paper with alcohol markers. This has been a wonderful series—thank you. Lovely card. That flower stamp set is so pretty and I really like your arrangement of the flowers. I normally stick to white for a sympathy card because I don’t want it to seem that I’m not taking the circumstances seriously, but you’ve proved that a colored base can be very appropriate too. Thank you.